For about the last 30 years my grandmother would bake 3 dozen cookies and send them out to all her grandchildren on their birthdays. Well Grandma is now 100 and stopped the tradition last year. Not because she can no longer bake cookies but because of the expense. With 30+ grandkids (I have lost count) that gets a bit pricey baking and shipping all those cookies. Grandma still bakes plenty of goodies but now to enjoy them you have to go and visit her in AZ! So it has been 2 birthdays since I have gotten any cookies and I miss getting that package. Grandma always go those cookies to me right on time and it was such a treat. So this year I decided to start a tradition of my own – Send birthday cookies to all my nieces and nephews. First up was Jaci with a January 5th Birthday!! I went with a batch oc choclate chip cookies for her. I gathered up all my ingredients and got started. The tricky part now with baking cookies is Kris and I cannot taste test them. We have been wheat free for the last 3 years so probably not a great idea to try it now. Good news our neighbors were happy to come over and try the cookies hot out of the oven. Once we got the thumbs up it was time to let the cookies cool before packing them up. We were one day late getting them shipped (something I need to work on) so Jaci got her cookies the day after her birthday. 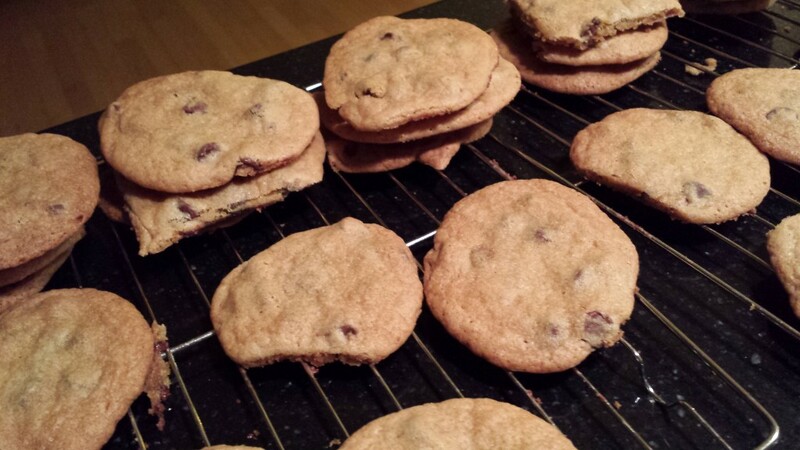 We did get a text from Jaci – “We got the cookies and they are delicious!” Kris and I were happy to hear that. Cheers! Pre-heat oven to 375ºF. Stir flour with baking soda and salt; set aside. In large mixing bowl, beat butter with sugar and brown sugar at medium speed until creamy and lightened in color. Add eggs and vanilla, one at a time. Mix on low speed until incorporated. Gradually blend dry mixture into creamed mixture. Stir in nuts and chocolate chips. 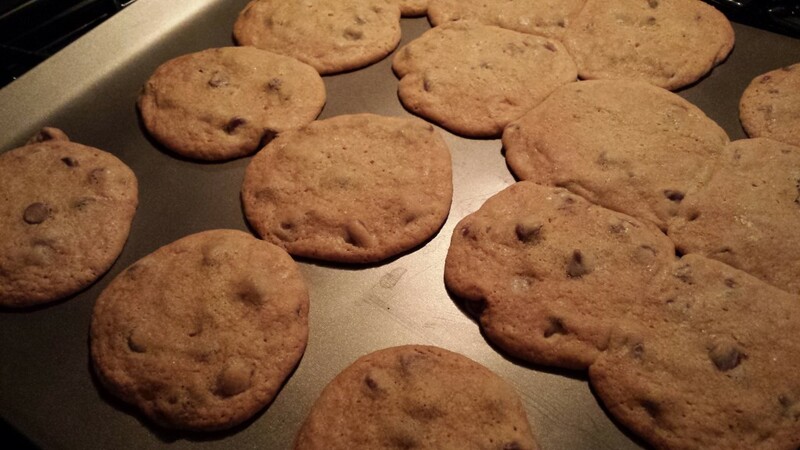 Drop by tablespoon onto ungreased cookie sheets. Bake for 9 to 11 minutes or until golden brown. Yummy! Making these today. How about posting your snicker doodle recipe too! Hope they were tasty! 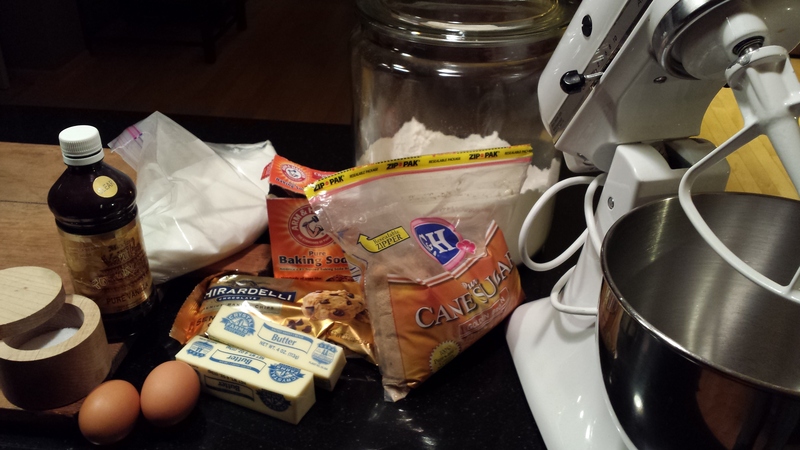 When I make my next batch of snicker doodles I will be sure to post. Cheers!